All week long, Clotilde Dusoulier of Chocolate & Zucchini will be sharing recipes from her latest, The French Market Cookbook, answering our questions, and giving away copies of her book to a few lucky readers. With her as our guest editor, we're feeling slightly more French -- and significantly more inspired. Brittany is a land of butter, and with this butter they make shortbread cookies that are gloriously golden and shatter-in-your-mouth crumbly. 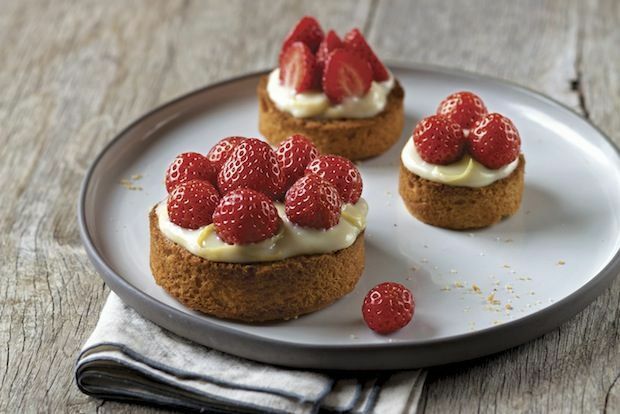 These sablés bretons are traditionally served on their own, but in recent years French pastry chefs have taken to using them as the foundation for fruit tartlets, especially strawberry. In my version, the pastry cream is subtly flavored with lemon, which bolsters the sweetness of the berries. Clotilde Dusoulier is a French food writer based in Paris. Her focus is on fresh, colorful, and seasonal foods, making room for both wholesome, nourishing dishes and sweet treats. An enthusiastic explorer of flavors and observer of culinary trends, she contributes to international food and travel magazines, and writes cookbooks and guidebooks. She lives in the Montmartre neighborhood of Paris with her boyfriend and their young son.